Thank you, Secret Agent James for sending me this photo. And no, that is NOT me in the picture! Yes, this is a big time FAIL! 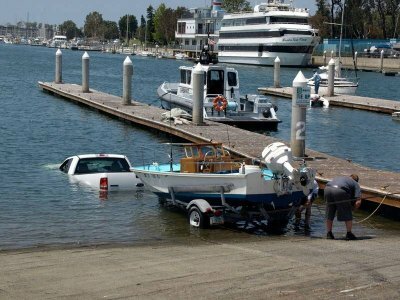 For those with no common sense, people tend to back their boat in, or have it hoisted from a crane. For a higher resolution of the above photo, click here. We’ve had high surf advisories for the last few days; I haven’t heard of anyone getting in the water over the weekend. That may be fine by me, as my hearing is just now recovering from diving while slightly congested at the Christmas Scavenger hunt last weekend. Looking at the swell maps, all of Palos Verdes looked blown out over the weekend. I’m hoping to make a New Year’s day dive on January 1st, or maybe one last 2009 lobster dive before. However, the uncannily accurate Weather Service is predicting rain this Wednesday. My dive buddy Dr. John Bibb took that photo at the Marina del Rey boat launch. A couple from Arizona were backing their boat down the ramp when the rear tires on their truck began sliding. The driver gunned it, but the truck spun about 120 degrees into the water. The engine froze and with the windows down, the truck began filling with water. A tow truck was called, and it pulled the boat trailer, which was now closer to dry ground than the truck, backwards up the ramp. Forgot to mention, here’s the original picture.